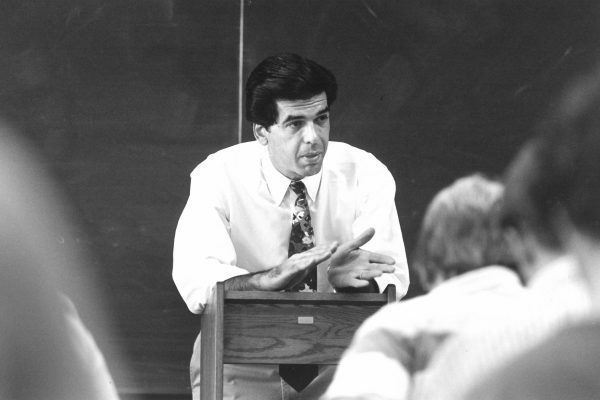 Former W&L Professor John R. Handelman Dies at 69 At W&L, Handelman taught popular courses in comparative politics, Chinese politics, Japanese politics, and U.S. foreign policy. John Robert Handelman, professor of politics at Washington and Lee University from 1973 until 1998, died on Sept. 30, 2017, in Ann Arbor, Michigan. He was 69. At W&L, Handelman taught popular courses in comparative politics, Chinese politics, Japanese politics, and U.S. foreign policy. In 1989 and 1990, he was a visiting scholar at the George Washington University Sino-Soviet Institute in Washington, D.C., and in 1991 he taught at Fudan University, in Shanghai, China. Handelman was born July 6, 1948, in New York City, New York. He earned his B.A. in government from Hamilton College (1970) and his M.A. (1972) and Ph.D. (1974) in political science from the Maxwell School at Syracuse University. He did post-graduate work in East Asian studies at the University of Virginia. Before coming to W&L, Handelman served as a teaching assistant in the department of political science at Syracuse University. At W&L, he started in 1973 as an instructor and achieved full professorship in 1989. In 1998, he moved to Fort Lauderdale, Florida, where he enjoyed a new career: managing a bookstore. Among his many publications was the book “Introductory Case Studies for International Relations” (1974), which he co-authored. He also lectured and wrote extensively on Chinese politics. Among his professional affiliations were the American Political Science Association and the International Studies Association. Handelman’s activities at W&L included service on the East Asian Studies Committee and the Faculty Executive Committee. He also served as the faculty adviser for Lambda Chi Alpha fraternity. Handelman is survived by his wife, Gwen Thayer Handelman, who taught at the W&L Law School from 1986 to 1998; his daughter, Christina Handelman; his granddaughters, Lucy and Phoebe Barker; his sister, Susan Lowrey; his nephews, Howard, Steven and Neal Lowrey; his grandnephew, Sam Lowrey; and Gwen’s son, Sam, and grandson, Benjamin Lee-Kweku Johnson. Memorial services will be held in October in Ann Arbor, and this winter in Fort Lauderdale, Florida.